Morgan Schneiderlin scored five minutes into his first Manchester United appearance as they beat Mexican side Club America 1-0 in Seattle. New signings Schneiderlin, Memphis Depay and Matteo Darmian were all involved from the start. Bastian Schweinsteiger was one of 11 United changes for the second half. Schneiderlin's goal was decisive in a drab game, the £25m signing from Southampton meeting Juan Mata's far-post cross with a looping header. One Direction did a concert at the CenturyLink Field on Wednesday. Parts of the pitch were painted green and the whole surface was heavily watered prior to kick-off. After the game, United boss Louis van Gaal said: "It was not good. It was difficult. The first surface is artificial and natural grass over. It is always moving. You can get more and more injuries. Club America's fans in a crowd of 46,857 provided a colourful backdrop to the game, a section of them in the top tier banging out a repetitive drum beat whilst others twirled yellow and blue umbrellas above their heads on a still and dry night. Playing in a number 10 role behind captain Wayne Rooney, Depay flitted in and out of the contest and was on the end of a late tackle by Rubens Sambueza that earned the Club America captain a booking. Darmian was rescued by goalkeeper Sam Johnstone, who rushed out to clear after Miguel Samudio had lost his marker. Marouane Fellaini was the only senior player to miss out as goalkeeper David De Gea, a Real Madrid target, and winger Antonio Valencia were absent with injuries described as minor by their club. 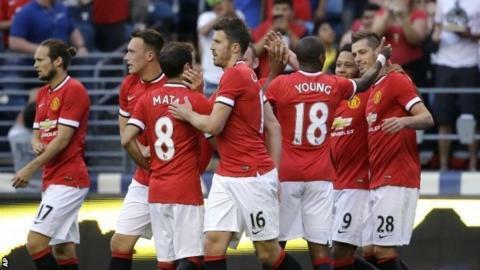 United play the second match of their US tour against MLS side San Jose Earthquakes at 04:00 BST on Wednesday.